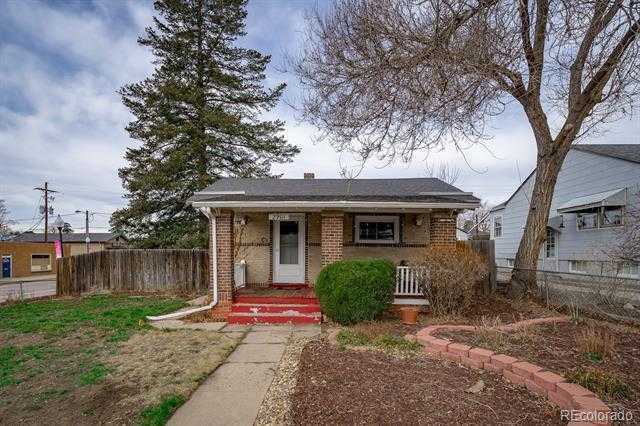 This turn-of-the-century 2 bedroom, 1.5 bath brick bungalow is a great starter home on a large, flat corner lot in Wheat Ridge just 3 blocks from NW Denver. The location is super close to Sloans Lake, Edgewater, and 38th Ave in Wheat Ridge in addition to minutes from Highlands and downtown Denver. Terrific home with great opportunity in an affordable area walkable to so many things Denver offers. This bungalow has a unique open floor plan with exposed brick divider in the main living area, which connects to an eat-in kitchen, bedrooms, and full updated bathroom with a claw foot soaking tub. The basement has a BD; bathroom, laundry area, unfinished storage, and a bonus finished room for to use as a movie/games or office area. The home is small but offers space to entertain and be comfortable. The fenced yard currently has a small fire pit, large garden area, and room for your animals, which make the space ideal for outdoor relaxing and entertaining. Please, send me more information on this property: MLS# 4171680 – $355,000 – 2901 Chase Street, Wheat Ridge, CO 80214. I would like to schedule a private showing for this property: MLS# 4171680 – $355,000 – 2901 Chase Street, Wheat Ridge, CO 80214.